One of the globally leading computer brands, Dell launched its voice calling tablet Venue 7 3000 in India in 2013. Like always, this product from Dell is a real trendsetter in the market. Dell Venue 7 3000 Series Tablet best price is 10438 on amazon.in. 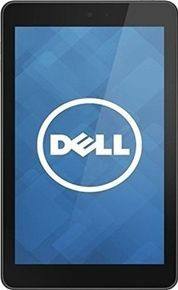 To help you decide its worth, here are detailed Dell Venue 7 3000 Series Tablet reviews and specifications. Dell Venue 7 3000 Series Tablet houses a trendy and sleek design. The top edge of the tablet has got a 3.5 mm audio jack and the screen lock button is located on the right edge. Micro usb 2.0 port is located on the left edge, adjacent to the dedicated volume keys. A plain rear with the Dell logo in the middle and an intel logo at the bottom add to the grace of the device. It incorporates a 1.6 Ghz dual-core Intel Atom processor. The 7 inch tablet has an inbuilt memory of 16 GB, expandable upto 32 GB by a micro sd card. The powerhouse of the device is a non-removable 4100 mah Li-ion battery. Dell Venue 7 3000 Series Tablet runs on Android v4.2.2 JellyBean, which is not upgradable to the latest Android version. The tablet includes Bluetooth 4.0, A-GPS, wifi and single HSPA sim support. Dell Venue 7 3000 Series Tablet sports a 3.15 MP autofocus primary camera with geo-tagging and has no flash. The camera resolution is 2048x1536 pixels. Daylight pictures are a nice view with not very fine details to the depth. The camera is capable of video recording. The VGA front camera is a genric 0.3 MP camera. The 7 inch display of the tablet is an IPS LCD display with a resolution of 1280x800 pixels and a capacitive touchscreen. The display is a joy to watch and provides great viewer experience. Dell Venue 7 3000 Series Tablet online price in India is around 10550. For detailed Dell Venue 7 3000 Series Tablet online price comparison, have a look at various online shopping websites. The processing speeds are swift and multitasking experience is very fluent. No time lag while switching apps too. The device overall is the best option if Dell is your call.